Image Description: a rainbow-coloured collection of display folders with the spines facing out. I’ve been trying to figure out for a while how to best talk about these stationery items that I’ve received. I think I’ve figured out how I can discuss them. For me, Stationery is a passion of mine, and I enjoy many aspects of it. The texture of book-covers, the feel and smell of paper, and how easy it is to use a pen (how well the ink flows – that sort of thing). This post is going to be long, however, it’s mostly going to be “I have this item and I like it” sort of post. Expect more squee-ing rather than in-depth commentary. My apologies in advance as a lot of the photos have flash and glare due to the shiny plastic. Image Description: The background of the image is a navy blue couch with an alternating pattern of dark yellow fleur-de-lis pattern and a maroon red pattern. 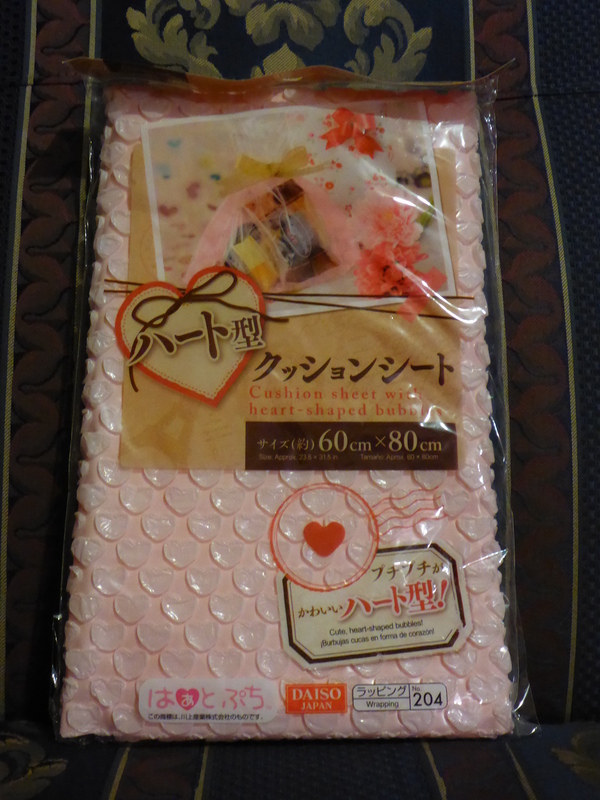 In the foreground is a packet of pink heart-shaped bubble-wrap from Daiso. I love bubble-wrap, and I like pink, so an item that is a combination of those two things is brilliant. Image Description: The background of the image is a navy blue couch with an alternating pattern of dark yellow fleur-de-lis pattern and a maroon red pattern. 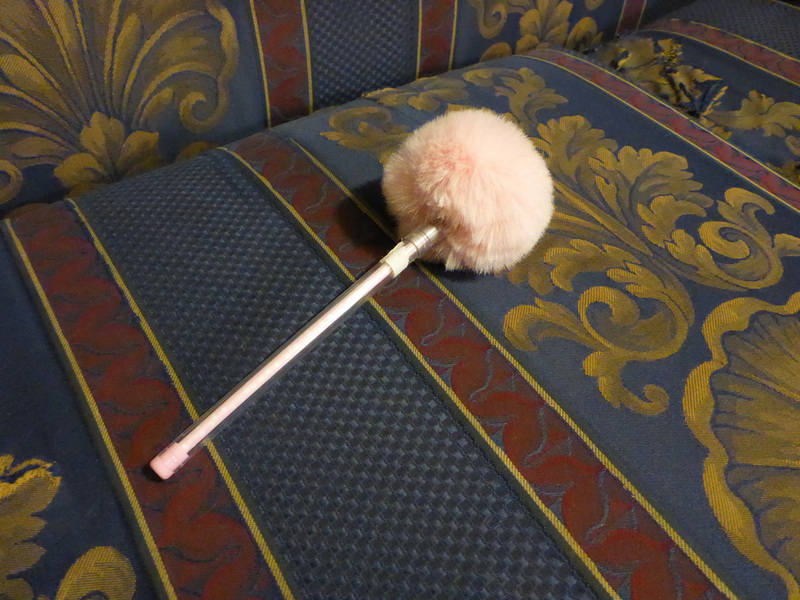 In the foreground is a pen that resembles a thin tube with a pastel-pink pom-pom on the end of it. 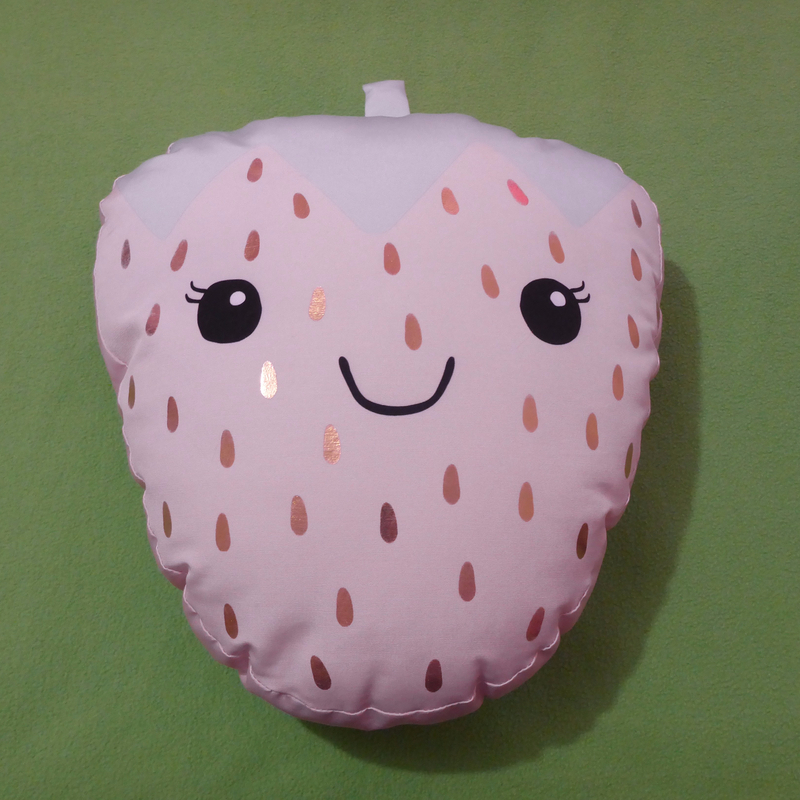 Previously I wrote a review for this item (you can check out the link if you like). I adore this pen, I love the feel of the fluffy tip, and it’s very stimmy. Image Description: The background of the image is a navy blue couch with an alternating pattern of dark yellow fleur-de-lis pattern and a maroon red pattern. 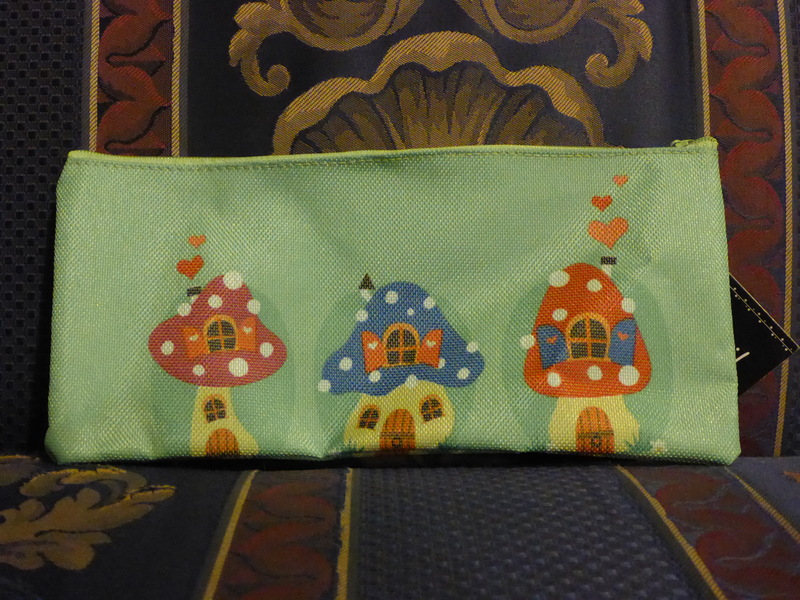 The foreground contains a pencil-case, it’s a green canvas material with three toadstool houses (purple, blue and red) on the front (the type that fairies or smurfs would live in). I enjoy the canvas texture of this pencil-case. The size is also more convenient for me to carry around. I now have two small pencil cases in my backpack instead of the big heavy one I keep at home. I’m trying to cut down on how much weight I carry around with me in my back-pack or shoulder-bag. Image Description: The background of the image is a navy blue couch with an alternating pattern of dark yellow fleur-de-lis pattern and a maroon red pattern. In the foreground is a baton-like object, it’s a 5 pack of stackable highlighters. 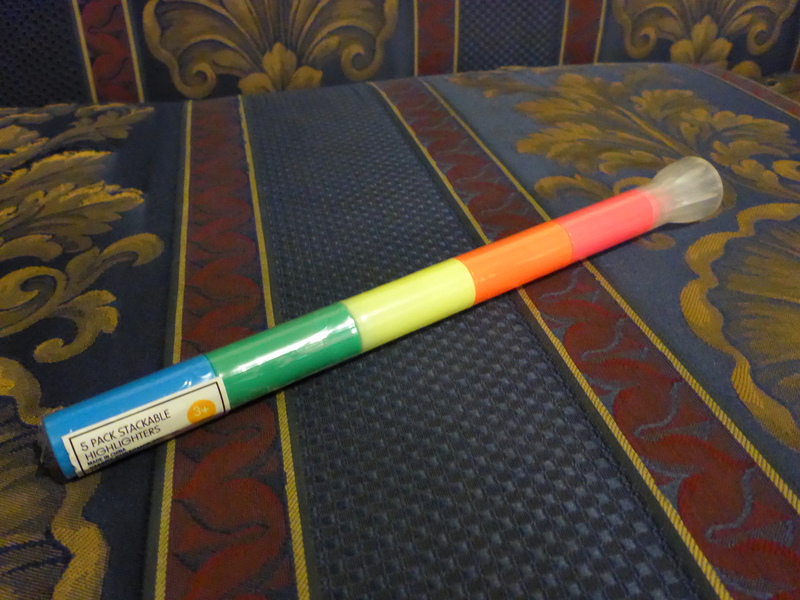 The highlighters are (in order from the top) red, orange, yellow, green, and blue. Image Description: The background of the image is a navy blue couch with an alternating pattern of dark yellow fleur-de-lis pattern and a maroon red pattern. 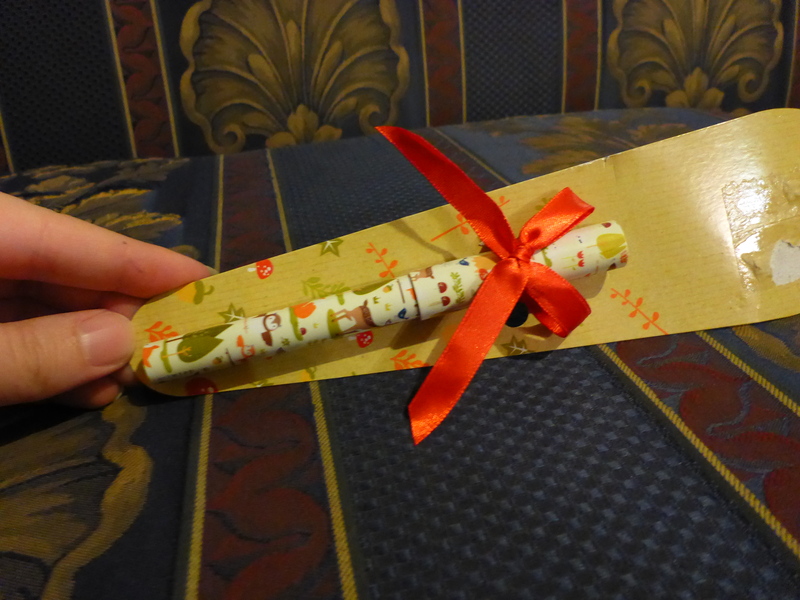 In the foreground is a pen tied with a red ribbon to a tan-brown piece of cardboard. The pen has woodland creatures (foxes, owls, and deer) and trees printed on the pen. With regards to my Bullet Journal and journal-writing, I usually prefer to use black ink pens, however, this pen is so adorable, I’m happy to make an exception. I usually prefer to use blue and red ink in combination. I like the visual of a contrasting combination. Image Description: The background of the image is a navy blue couch with an alternating pattern of dark yellow fleur-de-lis pattern and a maroon red pattern. 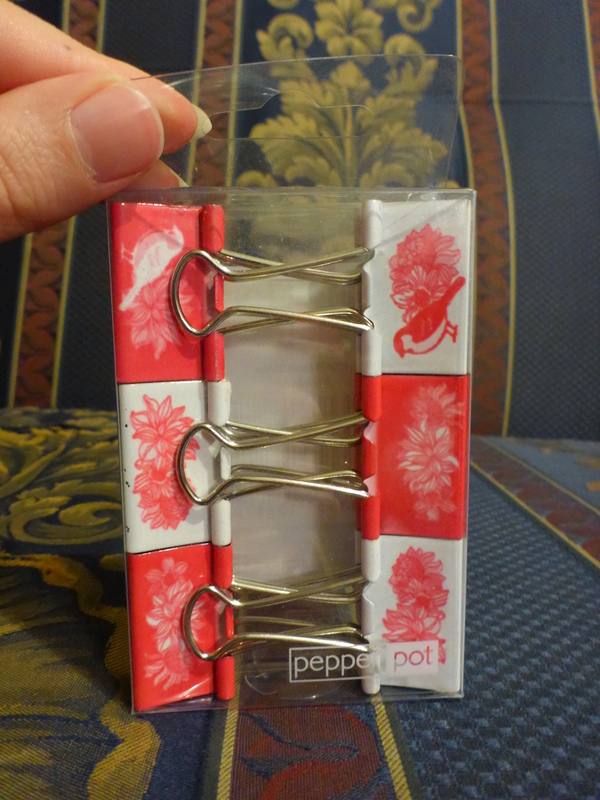 In the foreground is a small plastic packet of bulldog/binder clips with an alternating pattern. One type of pattern is a white background with red flowers and a small red robin. The other type of pattern is a red background with white flowers and a small white robin. 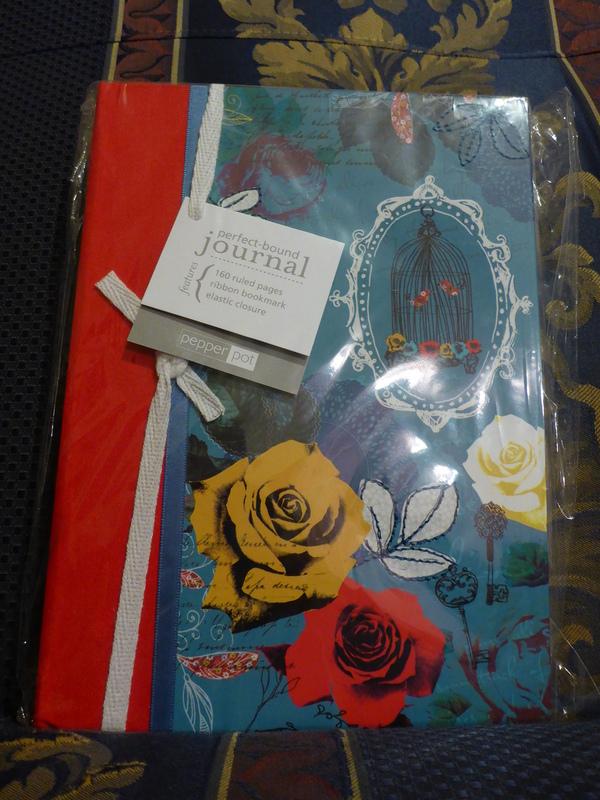 These are pretty and I can use them as book-markers for my Bullet Journal. Or keeping paper documents together. Either way. Image Description: The background of the image is a navy blue couch with an alternating pattern of dark yellow fleur-de-lis pattern and a maroon red pattern. The foreground is focused on an item in a plastic packet. The item a blue fold up ruler that has two halves. One half is a standard ruler half (lines and units of measurements). It has a collection of multicoloured owls decorating the front. The other half is also a standard ruler half (lines and units of measurements), however, it also has stencil shapes carved into this side. 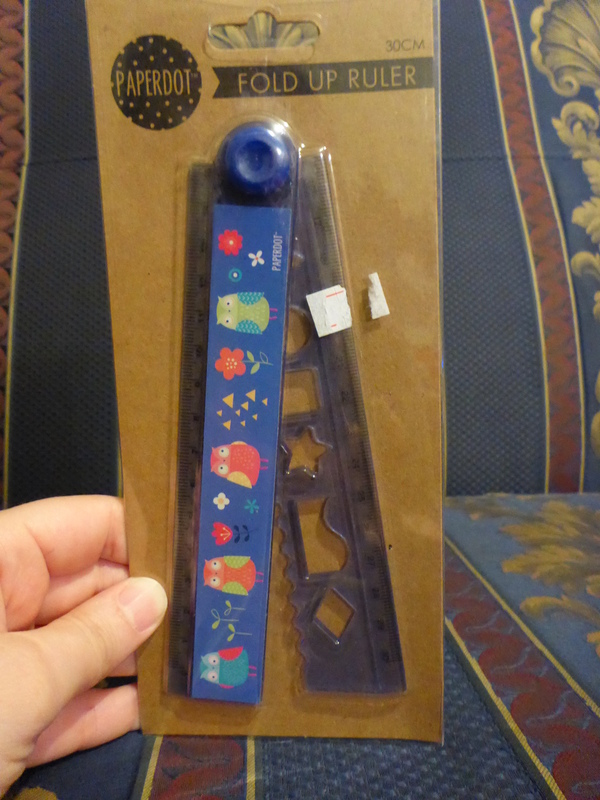 I love this ruler, I love the stencil aspects, and I love how it folds out into a big ruler. It makes drawing some of my Bullet Journal pages a lot easier. Image Description: The background of the image is a navy blue couch with an alternating pattern of dark yellow fleur-de-lis pattern and a maroon red pattern. In the foreground is a pale-white hand holding a plastic case that contains three erasers that resemble pencils. From left to right: green, blue, and red. 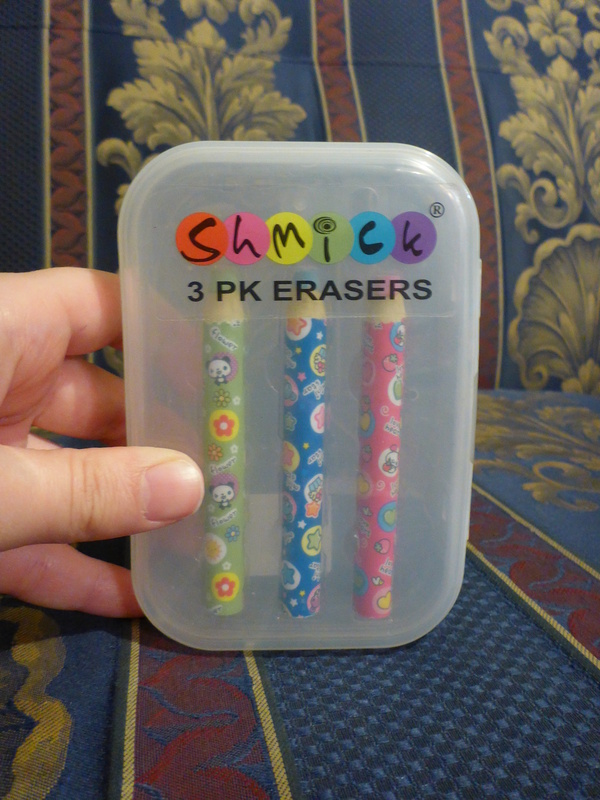 There’s text on the top of the plastic box that reads “SHMICK 3PK ERASERS”. I haven’t used these ones yet, however, they are so cute and I love how they’re kept in their separate case so they don’t get smudges on them. Image Description: The background of the image is a navy blue couch with an alternating pattern of dark yellow fleur-de-lis pattern and a maroon red pattern. In the foreground is two items (both exactly same): these items are sticker books for labelling items. 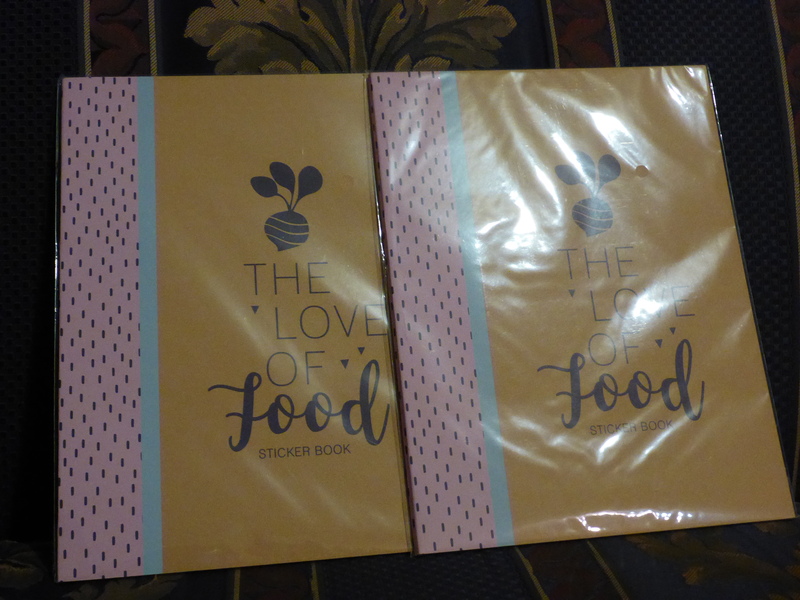 The text on the front of the book reads “The Love of Food sticker book” and there’s a stripe down the left-hand side of the books that resemble watermelons. I love labelling things, however, I am full of enthusiasm and terrible with follow-through. I have half cut-out printable documents scattered throughout my house and I know, deep down, I should probably just accept that this is just something I don’t have the mental capacity for. There’s a lot of little steps that accompany labelling. But with these, I don’t have to worry about those extra steps, it’s so helpful and thoughtful of K.A. to give them to me. Image Description: The background of the image is a navy blue couch with an alternating pattern of dark yellow fleur-de-lis pattern and a maroon red pattern. In the foreground is a pale-white hand holding a notebook in a plastic-bag covering. 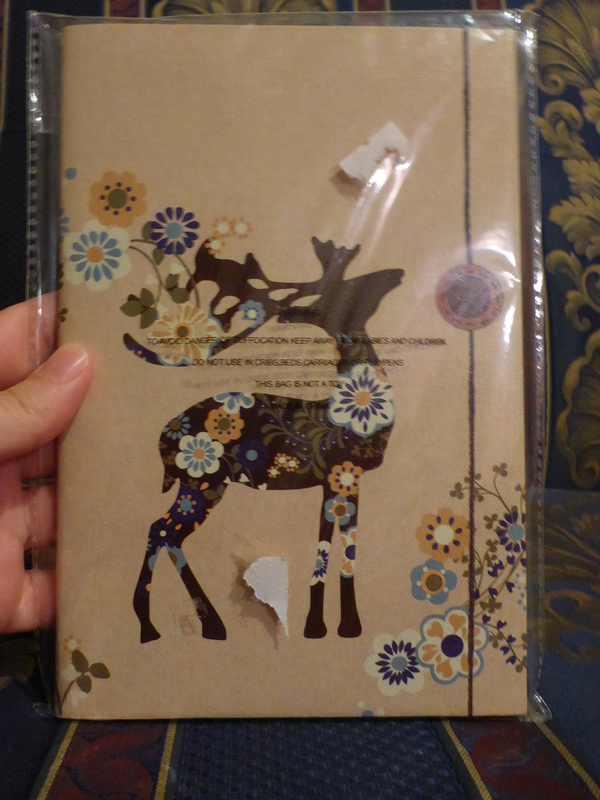 The cover of the notebook is a tan-brown with a dark-brown stag/hart on the cover. The stag/hart is decorated with blue and yellow flowers. The cover also has these same blue and yellow flowers sporadically decorated around the cover of the book. I love notebooks, I thoroughly enjoy flicking through the pages of a new notebook, and I also enjoy hoarding them. Mwuhahahahaha. Image Description: The background of the image is a navy blue couch with an alternating pattern of dark yellow fleur-de-lis pattern and a maroon red pattern. In the foreground is a pale-white hand holding a small notepad. 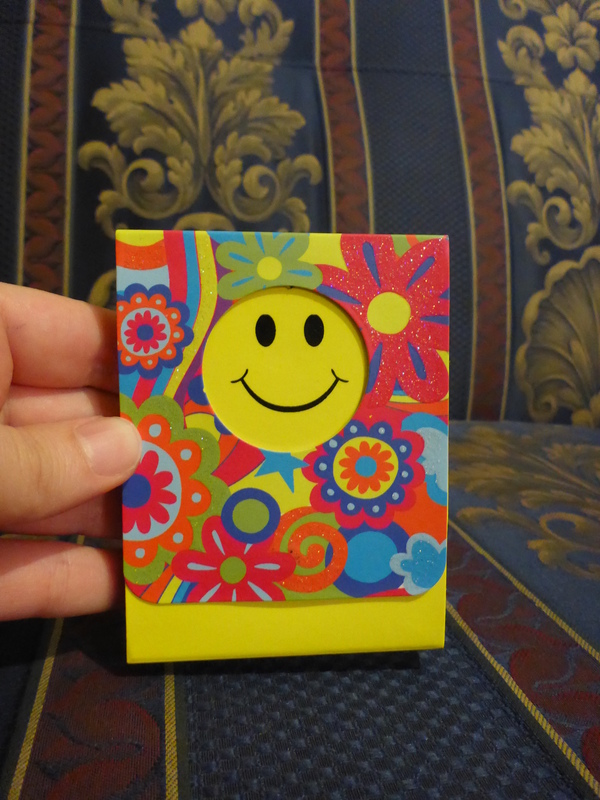 The notepad is mostly yellow, it has a small window with a yellow smiley face, however, there is a shiny outer cover with multicoloured flowers (with glitter), so it looks like the smiley face is surrounded by flowers. Image Description: The background of the image is a navy blue couch with an alternating pattern of dark yellow fleur-de-lis pattern and a maroon red pattern. The foreground contains a pale-white hand holding the previously mentioned notepad. The notepad’s layers are all spread out for the viewer to see. 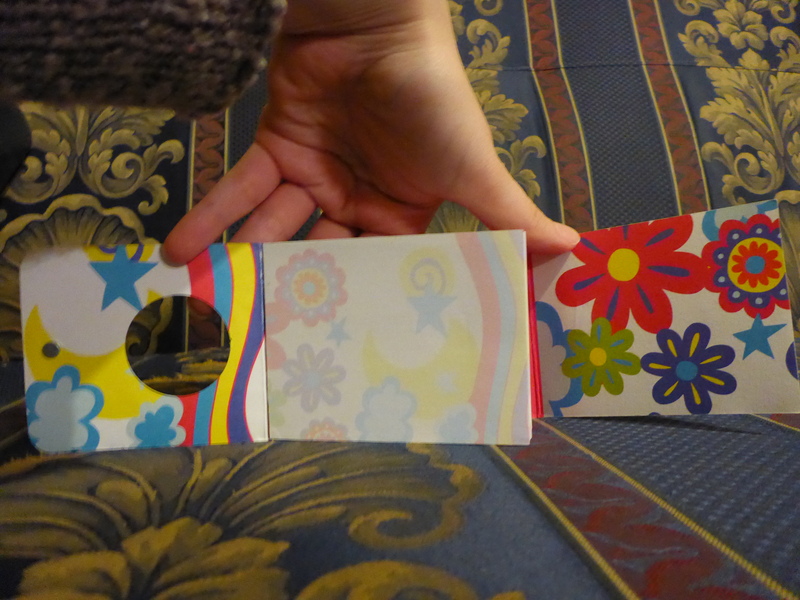 So there’s the interior of the outer layer of the notepad (clouds, yellow crescent moon, and a rainbow), the notepad paper, then a protective layer on the bottom (multicoloured flowers). This particular notepad has a magnetic clip to keep it closed (you can see it in the second photo). It’s such a satisfying feeling to feel the pull of the magnets closer together and to hear the sharp “snap” sound as well. Image Description: The background of the image is a navy blue couch with an alternating pattern of dark yellow fleur-de-lis pattern and a maroon red pattern. In the foreground is a close-up shot of a small notepad. The notepad has a teal backdrop with an orange fox on the front. 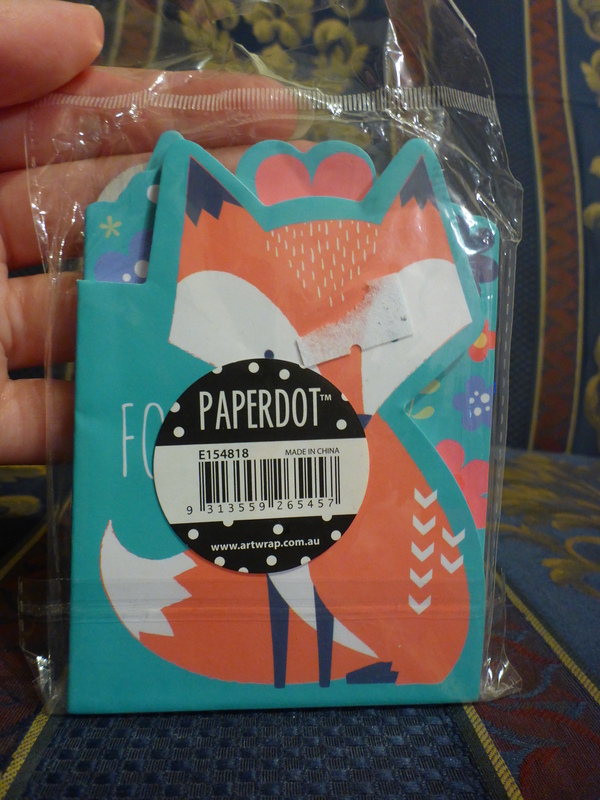 I love this particular fox design made by Paper Dot. It’s super cute. There’s a problem though, which is that I can’t find any working website link/URL that connects me to this business. I was hoping I could find a working link, that way if people wanted to know where they could find these items, I could direct them, but alas I cannot. Side note: if you are a business, and you have your website printed on your stock, keep your website up to date, otherwise you’re shooting yourself in the foot. It’s a big business opportunity that’s been lost. Image Description: The background of the image is a navy blue couch with an alternating pattern of dark yellow fleur-de-lis pattern and a maroon red pattern. In the foreground is a perfect-bound journal with a mosaic collection of images that make up the front cover. The background is a teal-blue with a vertical red section around the spine of the book. There’s a white length of string around the section where the red and teal sections end. In the bottom left corner is a yellow and red rose. There’s also a leaf that’s been outlined with thread. In the top right corner is a white bird-cage with two birds. I just adore the front cover of this book. It’s so pretty! I love the combination of colours and images, but I also enjoy the different textures on the cover. It may not be obvious at first glance, however, there are thread stitches in the cover. It has 160 ruled pages, so it’s a bit on the small side, I’ll probably use this book next when I run out of pages in my current Bullet Journal. Image Description: The background of the image is a navy blue couch with an alternating pattern of dark yellow fleur-de-lis pattern and a maroon red pattern. 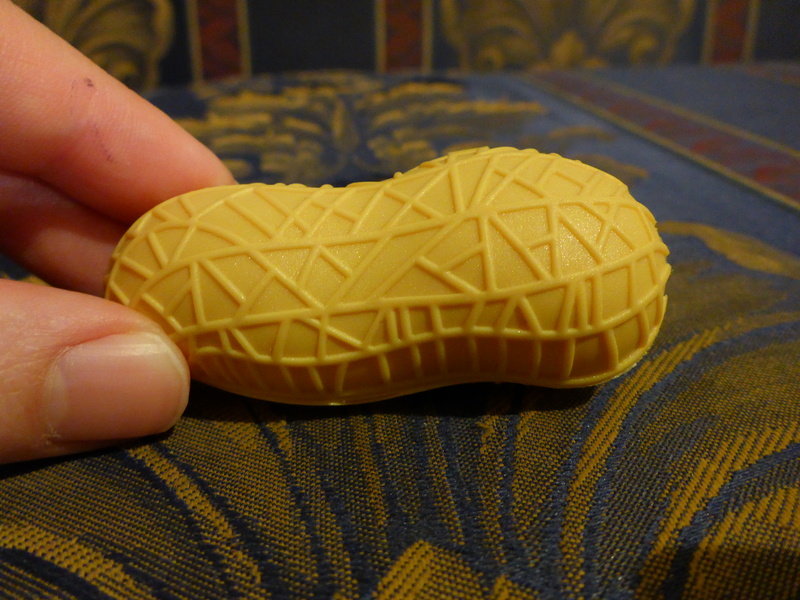 In the foreground is a plastic object that resembles a tan-brown peanut. Image Description: The background of the image is a navy blue couch with an alternating pattern of dark yellow fleur-de-lis pattern and a maroon red pattern. 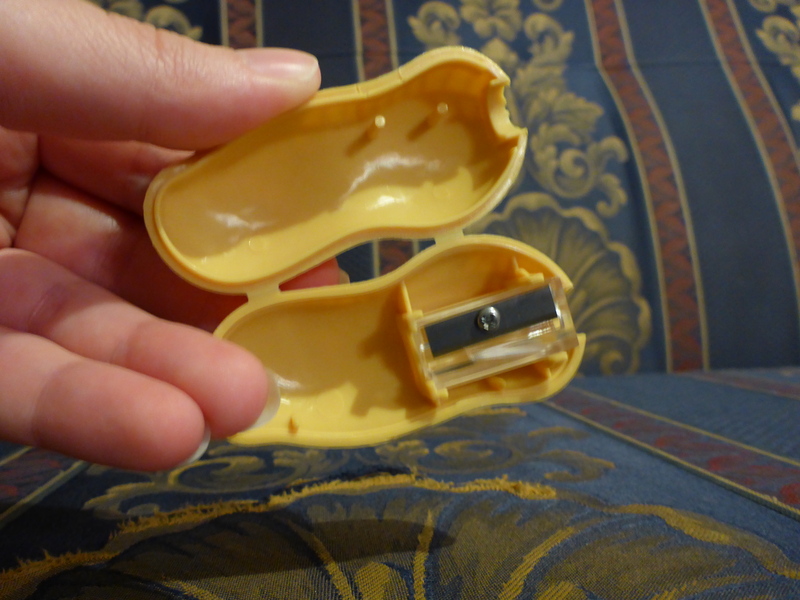 In the foreground is the previously mentioned plastic object that resembles a peanut, however, this image shows that the peanut has a pencil sharpener inside of it. Image Description: The background of the image is a navy blue couch with an alternating pattern of dark yellow fleur-de-lis pattern and a maroon red pattern. 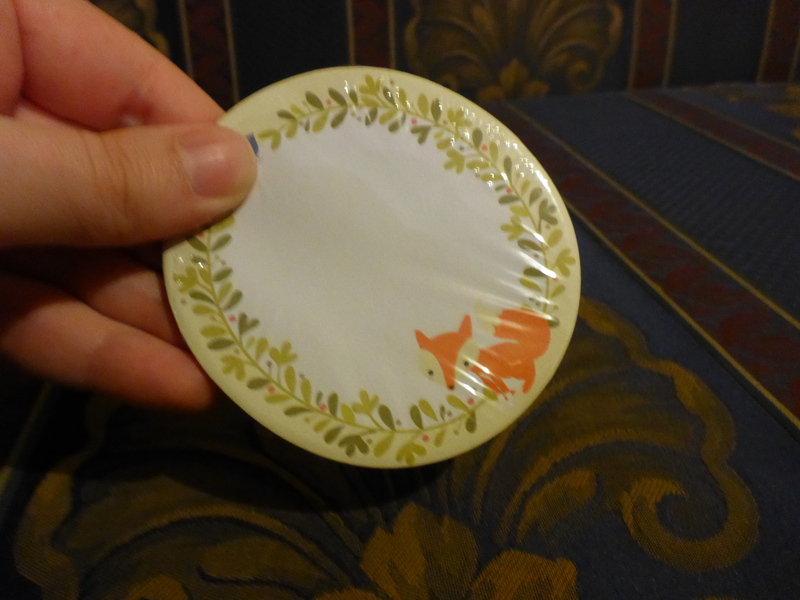 In the foreground is a close-up shot of a circular notepad that has a laurel pattern around the edge and small orange fox. Image Description: The background of the image is a navy blue couch with an alternating pattern of dark yellow fleur-de-lis pattern and a maroon red pattern. A pale-white hand holding two objects bound to tan-brown cardboard in plastic bags. 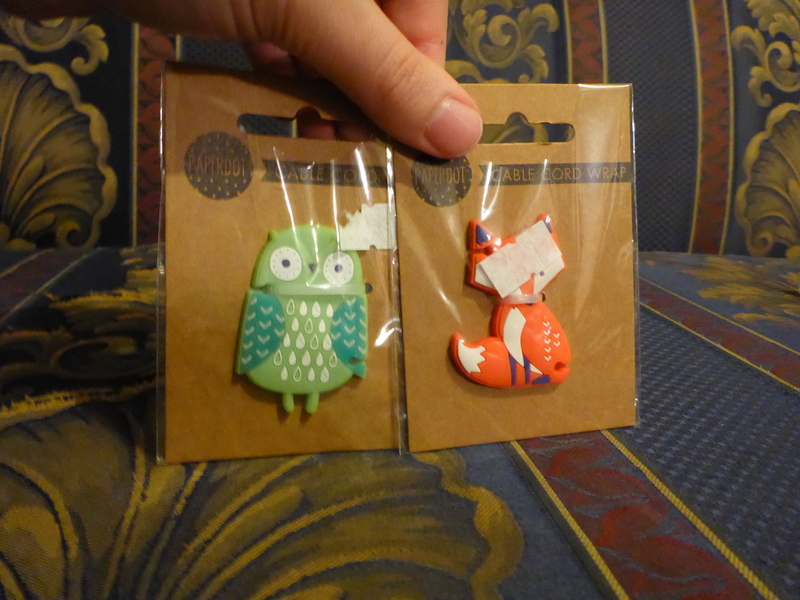 From left to right, a blue and green owl figurine and an orange and blue fox. Apparently, you wrap your headphone cords around these items, it’s super neat. Image Description: The background of the image is a navy blue couch with an alternating pattern of dark yellow fleur-de-lis pattern and a maroon red pattern. 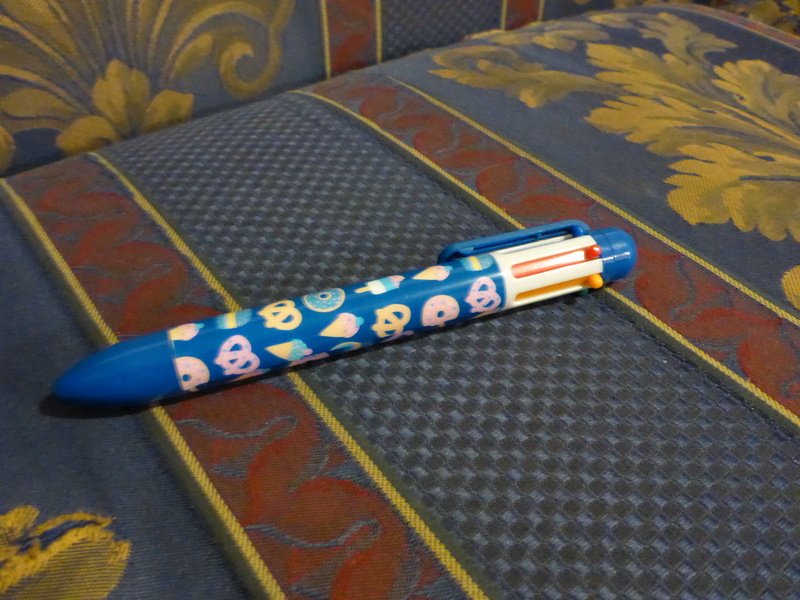 A blue 5-colour pen. The pen has various snack items decorating the outside of the pen (pretzels, ice cream cone, doughnut, paddle-pop). Image Description: The background of the image is a navy blue couch with an alternating pattern of dark yellow fleur-de-lis pattern and a maroon red pattern. 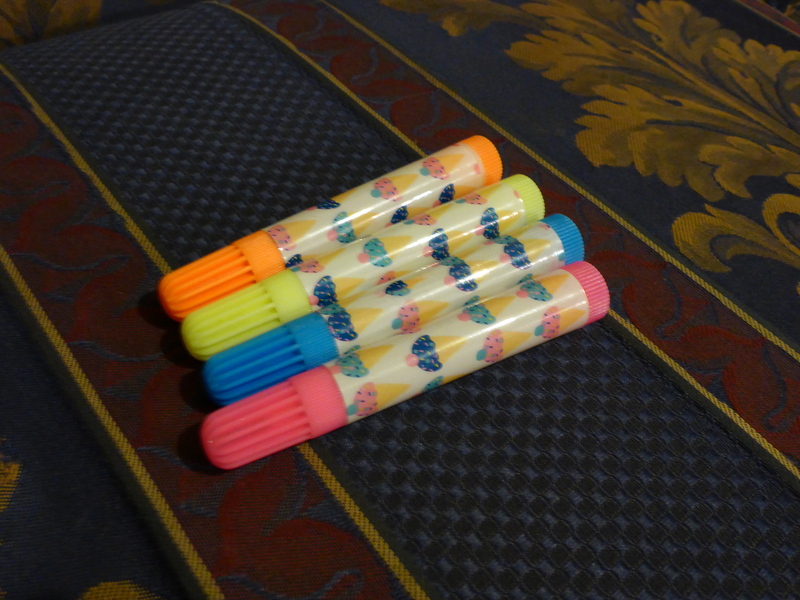 In the foreground is four highlighters (orange, yellow, blue, pink) decorated with ice cream cones. If you managed to get to the bottom of the post, I thank you and salute you, the post is already too long so I’m going to end it here. Thank you for reading and if you have any particular stationery design or brand you’d like to share, let me know in the comments section down below.